Hello Unique Color and Hello Awesome eye-appeal! 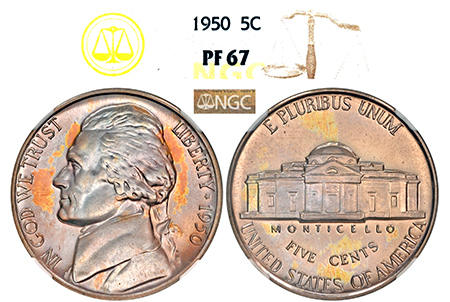 This is a 1950 proof Jefferson sure to stand out from the rest of the 437 examples NGC has graded in PF 67. The obverse and reverse sport WILD sunburst-orange, canary-yellow and violet hues! The way the color is displayed is truly beautiful! The surfaces are extremely clean and the eye-appeal is incredible.